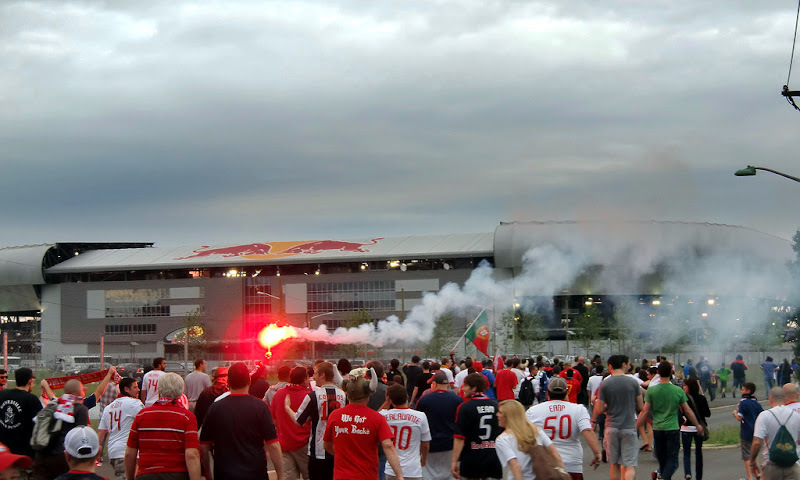 It's matchday again @The Cathedral of Football, Red Bull Arena (built by Makita)! This time, our glorious club takes on its I-95 rival Philadelphia Union (2:30pm ET, ESPN, match notes here). Let's look at how both teams come into this one. The Union are in the midst of a resurgence, as it has won the three MLS games played in the month of July. While the DOOP boys will be wary of their "old friend" Seb LeToux, they'll look to maintain their momentum, going into the All-Star break. Philly will be confident it can bring all three points back to PPL Park. The Red Bulls will be playing their third MLS game in a week. After letting two points slip away, last Sunday, the Red Bulls managed a huge mid-week victory, against Chicago. Former Union man Sebastien LeToux will certainly look to stick it to his old team and Kenny Cooper will look to snap out of his scoring funk (he last scored against Philly back in May). The Red Bulls will still be without Marquez, Pearce, Solli and Meara for this one an will hope that Barklage, Lade, Conde, Gaudette and McCarty continue their fine form. They'll also be hoping that Thierry Henry continues to find his rhythm and start scoring on a regular basis again. But nevermind all that, let's get to some predictions! I loved the way that Henry took the game by the scruff of the neck on Wednesday and willed us to victory. Philly has yet to get a point off us at RBA, and I expect that to continue. We are undefeated at home this season, so our only real enemy here is fatigue. 2-0 Red Bulls. Goals by Le Toux and Henry. I'm going to say that Sebastien LeToux sticks it to his old team, with a goal and an assist (to Henry). How could it be otherwise? 2-1 to RBNY! Based on Wednesday's result, let's pray that the sun is shining and humidity is up around 100% (especially as I will be far from the East Coast). Unfortunately, Philthy has reall turned things around since the Red Bulls escaped from Chester with a win (and no gunshot wounds) in May. The "never won at RBA" stat is a bit misleading, as this is only their 3rd year. Given our side's unpredictability, I'm calling it a 1-1 draw. Alrighty then! Hope to see you all today @The Cathedral of Football, Red Bull Arena (built by Makita). Viper Out!